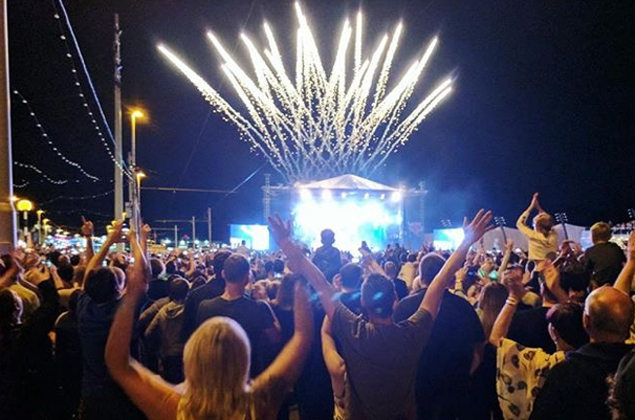 Livewire Festival is a three day event held at the Tower Arena in Blackpool, located right on the famous beachfront. This years line up included a much anticipated comeback for Will Smith performing as The Fresh Prince alongside Jazzy Jeff, featuring old school classics and debuting a new release. The duo had just flown in from Croatia as part of a European Tour with Blackpool; the final stop, before returning home to the US. Will Smith is a huge fan of Pyro Special Effects, so he and his team had specified a large scale production and that’s what we delivered. There were several challenges to overcome on this job, most notably that the show was not designed by the Entertainment Effects team. We were simply recruited to supply the special effects, program the firing system and rig the products on and around the stage, then supervise the event. The actual show design was the work or Eddie Romack from Strictly FX in the U.S – he’s Will Smiths pyro lead. For this reason, we had to work closely with Eddie to deliver his vision, which was made difficult by the eight hour time difference and the very strict timescales (only three weeks). 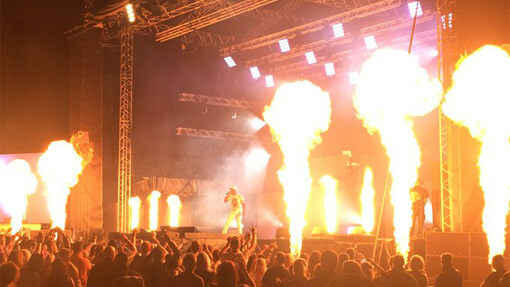 The scope of the show meant that this was one of the larger productions our team had been required to produce, requiring a wide range and quantity of special effects products including Roof and Stage Pyro, CO2 Jets and Flames. The first issue we needed to overcome was the supply of the itemised pyrotechnics Eddie had requested. Not all the effects, which are available in the U.S., are stocked in the U.K. or could not be produced in time. We therefore had to access the requirements and compile a list of suitable alternatives from our own stock and all of the UK suppliers for Eddie to choose from. The second issue was the complex programming requirements which Eddie had specified. The start of the show was dramatic with Will Smith rising up through a hole in the stage, through a cloud of smoke to a huge and rapid chase sequence of Pyrotechnic Gerbs across the whole width of the stage. This required us to fire sixty products in only three seconds. We had to contact our firing systems manufacturer to check that the system had the capacity to complete this ambitious task. After much conversation and testing, we decided to add in extra hardware in order to ensure that every item would fire at the one-tenth of a second timing. Will Smith’s love for pyrotechnics was not shared by his great friend Jazzy Jeff, who was not a fan of the loud bangs and flashes. So, prior to the performance it was suggested by Eddie that we let him fire a little pyro of his own as a way of getting him on board. At the end of the rehearsal we surprised him in the DJ booth and let him fire the ‘boom box’ as he called it. He recorded the whole thing on social media and has taken his first step to becoming a qualified pyrotec. The results were spectacular, the show was a huge hit and the crowd went crazy. Will Smith rose up through the stage, “tic tic tic BOOM” – the opening pyrotechnic sequence fired perfectly and Eddie was really happy with what the Entertainment Effects team were able to deliver.